Stereotypically speaking, writing about Alabama’s offense is about as much fun as writing about wallpaper: It’s there, but it works best when no one notices it. And the Crimson Tide’s pattern hasn’t substantially changed in decades: pedestrian quarterback spends the afternoon handing off, hitting the occasional play-action pass to keep a key drive or two alive, and not screwing things up for the defense. Rinse and repeat, forever. Who cares if the audience finds its eyes glazing over as long as the system gets results? Even when it’s good, it’s still the same. However, as anyone who watches Bama regularly knows, and as anyone who saw AJ McCarron outduel Johnny Manziel last September can attest, that conservative reputation often feels truer than it actually is. Entering this season, the Tide had averaged at least 30 points per game in six consecutive campaigns, a bar they’d previously failed to clear since 1983, and had eclipsed 3,000 yards passing in three of the previous four years, a mark they’d never hit prior to 2010. Still, at no point during Nick Saban’s tenure in Tuscaloosa had the offense threatened to replace the defense as the engine of the team’s success, and if ever there were a moment for the offense to retreat into its shell, 2014 looked like it. With McCarron gone, Alabama would be breaking in a new quarterback — under a new coordinator and behind an unsettled offensive line. Meanwhile, the backfield was stocked with a proven, All-SEC workhorse in T.J. Yeldon and a burly sophomore who was poised to surpass him in Derrick Henry. After the team’s season-opening win over West Virginia, Saban described his sensibilities toward the offense as “dinosaur age.” What better set of circumstances would the Darth Vader of the spread revolution ever have to pull back on the reins and play the game the way he wants football to be? Well, four games in, it’s safe to say pulling back isn’t on the agenda. Against West Virginia, the Crimson Tide spent part of the game in a no-huddle look, ran 82 plays, and racked up 538 yards of total offense.1 The following week, quarterbacks Blake Sims and Jacob Coker put the ball in the air 38 times against Florida Atlantic, combining for Alabama’s first 400-yard passing day since the 1988 Sun Bowl. In Saturday’s SEC opener against Florida, Bama lined up in an empty backfield set on its first play from scrimmage and proceeded to launch the opening salvo in the most un-Saban-like assault on record. That’s not just an over-the-top way of acknowledging that the Tide’s system appears to be more passer-friendly than in the past, although that has certainly been the case so far. Between Sims (who has taken the vast majority of snaps and emerged as the indisputable starter) and Coker, Bama is attempting more passes per game in 2014 than in any previous season under Saban, for more yards per attempt, more yards per completion, more yards per game, and a better overall efficiency rating. Six of Sims’s 23 completions against Florida covered at least 20 yards, leaving him as the most efficient passer in the SEC. All summer long, the vacancy at quarterback was the red-siren issue preventing Alabama from challenging Florida State at the top of the preseason polls, yet on a day when both no. 1 FSU and no. 2 Oregon were nearly undone by their Achilles’ heels (more on that below), Sims made a very persuasive case that Alabama doesn’t really have a fatal flaw. But competence under center — or in the shotgun, as the case may be — is only part of the story. Forty-two points on 645 yards of total offense against a blue-chip SEC defense falls beyond the realm of competent. Taken as a whole, it was a rare glimpse of what the most talented team in college football is truly capable of when it decides to deploy all of its weapons at once, and a reminder of why Saban pegged Lane Kiffin, of all people, as the perfect person to coordinate that arsenal. Given Kiffin’s humbling record as a head coach, it’s easy to forget that he was one of the minds behind one of the most prolific college offenses in recent memory, the 2005 USC attack that rode Matt Leinart, Reggie Bush, LenDale White, Dwayne Jarrett, et al. to within one yard of a second-consecutive national championship.2 Although Sims, a senior, has no chance of matching Leinart for longevity or accolades at the college level, Alabama comes closer to mirroring USC’s abundance of riches at the skill positions than any other current outfit, and got as near as it ever has to maxing out that potential against Florida. On the ground, Henry and Yeldon combined for 170 yards rushing on 38 carries and added another 66 yards on a pair of screen passes. Wide receiver Amari Cooper repeatedly posterized the best cover corner he’ll face this season, Vernon Hargreaves III, finishing with 10 catches for 201 yards and three touchdowns;3 for the season, Cooper remains the most productive receiver in the nation in terms of both receptions and receiving yards. After the first-half fireworks, Bama settled in during the second half with extended touchdown marches covering 66, 80, and 60 yards, which collectively milked more than 14 minutes off the clock. Even Drake, often an afterthought on the depth chart, was deployed to devastating effect on the first play due to Kiffin’s ability to get him matched up with a linebacker in man-to-man coverage. While we’re not in for a season’s worth of comparisons between Drake and Bush, the play was a reminder that Kiffin’s system is ideally suited to accommodating versatility and manipulating the defense in order to exploit it, which is not something I ever expected to say about an Alabama offense. Given the totals on the stat sheet, it seems a little ridiculous to suggest that Saturday was only the tip of the iceberg, but the fact is that Alabama’s explosiveness against Florida was frequently matched by its sloppiness. The Tide lost three fumbles in the first quarter, leading to UF’s first two touchdowns; later, Sims was picked off on Alabama’s first possession of the second half, setting up the Gators’ third touchdown to (briefly) tie the game at 21 apiece. Without those gifts, the Gators likely wouldn’t have scored at all. And that probably would have suited Saban just fine. As we learned last year, however, in the spread era even the stingiest defenses can no longer be counted on to hold every opposing offense in check every week. Alabama survived one shootout in 2013, outgunning Texas A&M in a 49-42 classic in September, but closed the season with back-to-back, high-scoring losses at the hands of Auburn and Oklahoma. If the 2014 edition finds a way to curb the turnovers without taking its foot off the pedal, it will be the most complete team in the nation by a wide margin. But even if the giveaways that kept Saturday’s game interesting for three quarters turn out to be a recurring theme, no Saban team has ever been better equipped to cancel them out with sheer firepower. • No. 1 Florida State 23, no. 22 Clemson 17 (OT): For what it’s worth, Clemson was clearly the better team in this game. In regulation, the Tigers outgained the defending champs by more than 100 yards of total offense and dominated the line of scrimmage, holding the Noles to negative rushing yards. In a battle of backup quarterbacks, Clemson freshman Deshaun Watson vastly outplayed FSU’s Sean Maguire, who appeared visibly rattled by the pressure in his first career start in place of the suspended Jameis Winston; Maguire was sacked five times, was hit about a dozen more, and threw two interceptions.4 In a battle of future first-round picks, Clemson defensive end Vic Beasley abused FSU’s left tackle, Cameron Erving, for two of those sacks. Late in the fourth quarter, the Tigers’ win probability climbed as high as 85.9 percent. Since the scoreboard broke in FSU’s favor in the end, the specifics weren’t worth very much to pollsters: With the victory, the Seminoles held on to the top spot in both the AP and USA Today polls by comfortable margins. 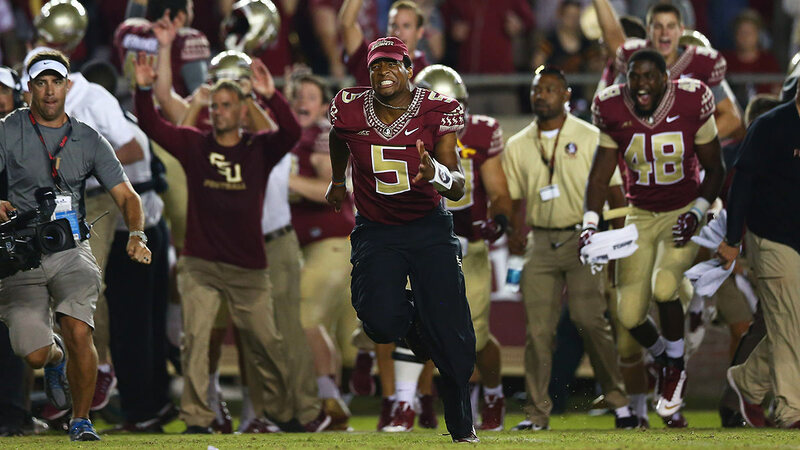 If anything, Winston’s temporary absence made analysts appreciate the full-strength Noles more. Winston may be an embarrassment and a burden in many respects, but the team we saw on Saturday night is not the same one we came to expect when no. 5 suited up. • Utah 26, Michigan 10: It’s hard to imagine a more apt response to Michigan’s offense than everyone in the Big House rising in concert and walking out, which is exactly what happened on Saturday. Yes, technically fans were ordered out midway through the fourth quarter due to the miserable weather, not the miserable performance of the home team. But symbolically, the exodus felt right. At that point, the Wolverines’ previous nine offensive possessions had resulted in five punts, three interceptions, and a turnover on downs; their only touchdown had come courtesy of the defense. Just before the weather delay, coaches yanked embattled senior quarterback Devin Gardner, who had just thrown his second INT, in favor of sophomore Shane Morris, who was promptly picked off at the end of his first possession. Most of the small handful of fans who returned following the delay were Utah partisans basking in their team’s 3-0 start. On Sunday, Michigan coach Brady Hoke declined to name a starting quarterback for next week’s matchup with Minnesota, but a QB controversy is small potatoes in the face of a burgeoning revolt among the fan base. Remember, the Wolverines lost five of their last six in 2013, including defeats to Michigan State and Ohio State that dropped them to 1-5 against the Spartans since 2008 and 1-9 against the Buckeyes since 2004. Earlier this month, they set the tone for 2014 by committing four turnovers in a 31-0 humiliation at Notre Dame. After the latest debacle, hope for an offensive turnaround in Big Ten play is hovering somewhere around zero. If the defense becomes demoralized, Hoke won’t survive the season. Barring a miracle, though, there’s not much left to salvage even if he does. • Mississippi State 34, no. 8 LSU 29: Don’t be fooled by the final score: Mississippi State mowed the field with LSU for 48 minutes before things got a little weird at the end, which is the price of admission when you’re facing off against Les Miles. Through three quarters, the Bulldogs had amassed nearly 500 yards of total offense, held LSU’s offense out of the end zone, and built a sturdy, 31-10 lead;5 a short field goal extended the advantage to 34-10 a few seconds into the fourth, after which the LSU rally was strictly academic. True to the hype, MSU quarterback Dak Prescott accounted for 373 yards, three touchdowns, and zero turnovers on the road, including a 56-yard run to pay dirt early in the second half, followed immediately by a wild, ad-libbed strike worthy of Houdini and/or Johnny Manziel. • Indiana 31, no. 18 Missouri 27: Indiana’s upset in CoMo was slightly less inspiring, if only because (unlike Mississippi State) the Hoosiers’ potential for runaway optimism is limited by an earlier loss at Bowling Green. In context, though, this result still seems fairly momentous: Indiana is the only Big Ten team this season with a victory over a ranked opponent — the rest of the conference is 0-5 in such contests — which automatically makes it a candidate to take advantage of Ohio State and Michigan’s diminished profiles in the B1G’s East Division. Even if the Hoosiers lack the consistency to mount a serious run at the title, on any given Saturday Kevin Wilson’s offense is capable of just about anything. There are better teams in the conference, but none more dangerous on a weekly basis. It’s time to rethink: Oregon’s invulnerability. The more I see of Marcus Mariota, the more obvious it becomes that he’s the best college quarterback in America, and the more concerned I get about him surviving the season intact. Against Washington State, Mariota was sacked seven times by a not-very-formidable pass rush and spent much of the night eluding rushers behind a makeshift offensive line that’s been decimated by injuries; the starting tackles on Saturday were a true freshman (Tyrell Crosby) and a former walk-on (Matt Pierson), and it showed. Under the circumstances, Mariota’s passing line against the Cougars (21-of-25 for 329 yards, five TDs, and no INTs) is a true work of art. But it was still barely enough to get Oregon over the hump in a 38-31 win that was every bit as close as that margin suggests. Although Mariota survived the weekend with no apparent injuries, the concern is obvious. 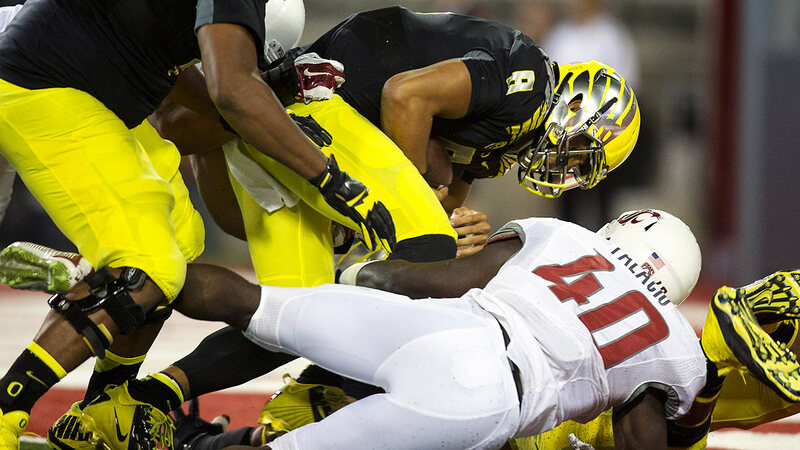 Remember how the Ducks looked after Mariota suffered a knee injury last November? After an 8-0 start, they were mugged by Stanford, blown out by Arizona, and pushed to the brink by Oregon State, with their quarterback looking visibly diminished throughout. The best news following the escape from Pullman: Next weekend is a much-needed bye before Oregon hits the meat of the Pac-12 slate. “Because he loves his teammates.” —Florida State coach Jimbo Fisher, on why Jameis Winston came out in full pads for FSU’s pregame routine despite his suspension. 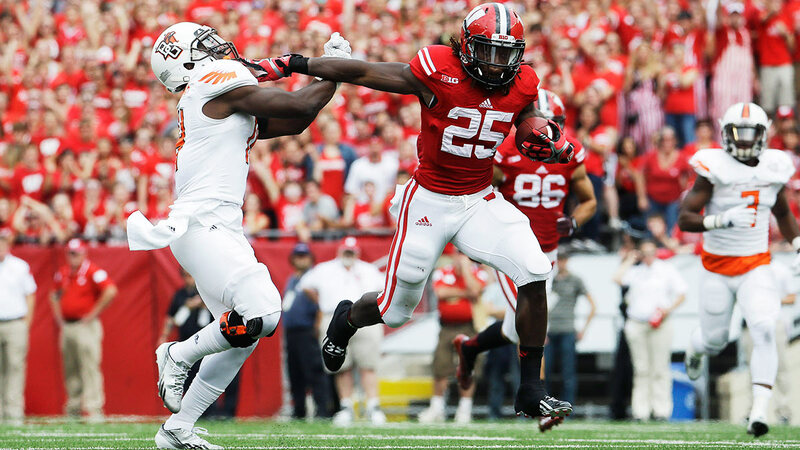 • Wisconsin’s Offensive Line: Bowling Green’s front seven may not be the ’74 Steelers, but this was still a jaw-dropper. While a lot of MAC defensive lines have been overwhelmed by Big Ten offensive lines over the years, none has ever been flattened as severely as the Falcons were in Saturday’s 68-17 loss. The Badgers set a Big Ten record for rushing yards in a game, which is like someone in Wisconsin setting a new record for flannel. That’s not a mark that falls every day. • Clemson LB Stephone Anthony: Anthony wreaked havoc at Florida State, officially recording eight total tackles (two for loss), one sack, and two QB hurries in the losing effort. Unofficially, he was the tip of a relentless spear that spent all night in the Seminoles’ backfield. In regulation, FSU as a team had minus-12 yards rushing, the result of 10 TFLs by Clemson’s defense (including sacks) for minus-60 yards. • Oklahoma RB Samaje Perine: In his first career start, Perine lit up West Virginia for 242 yards on 34 carries and accounted for four of Oklahoma’s five offensive touchdowns in a 45-33 win in Morgantown. That marked the best rushing game by any Sooners back since another true freshman, Adrian Peterson, went for 249 yards against Oklahoma State back in 2004. • Catch of the Year of the Week — Austin Hill, Arizona: In the first 59 minutes and 56 seconds, Arizona and California combined for 177 plays, 1,153 yards of total offense, 60 first downs, and nine touchdown drives covering at least 70 yards apiece. Then it got really crazy. The “Hill Mary” was a miracle in more ways than one: After three quarters, Arizona had trailed by 18 points, 31-13, and still trailed by 15 points, 45-30, with less than five minutes to play. With the game-winning heave, the Wildcats’ final tally in the fourth quarter alone came to 36 points, including 19 in the final three and a half minutes. Cal, which led the game until Hill’s feet touched down as time expired, suffered its 15th straight loss in Pac-12 play. • Virginia Tech QB Michael Brewer: With his team clinging to a 16-10 lead early in the fourth quarter, Brewer served up one of the most ill-advised throws of the day, a lazy, aimless screen pass in the middle of the field that found its way into the arms of Georgia Tech linebacker Paul Davis, who found his way into the end zone to give the Yellow Jackets a 17-16 lead. Fast-forward nine minutes, with the score tied at 24-24 and Virginia Tech hoping for either (a) an efficient two-minute drill to win, or (b) overtime. Instead, the Hokies got (c) an ill-advised lob by Brewer into double coverage, which was corralled by Georgia Tech’s D.J. White at the Hokies’ 40-yard line. Fast-forward again to the final play of the game, a chip-shot field goal to give the Yellow Jackets a 27-24 win and an early leg up in the ACC Coastal. • UConn’s Offense: Connecticut had 10 offensive possessions against South Florida, the first nine of which yielded, collectively, two completed passes, three first downs, one turnover, zero third-down conversions, and zero points on a grand total of 32 plays. The Huskies did manage to find a spark on their last possession, yielding one final sliver of drama in the form of a failed onside kick to seal a 17-14 defeat.6 If you gave up your Friday night to watch this game, I hope it was worth it. • Pac-12 Officials: Can Washington State plausibly boil its 38-31 loss to Oregon down to one critical no-call on its final offensive possession? No. Was the call in question clearly pass interference on Oregon cornerback Dior Mathis, warranting a first down in Ducks territory? Yes it was. Cougars quarterback Connor Halliday was sacked on the following play, a fourth-and-13 from the Oregon 38, and didn’t see the ball again. Wazzu wouldn’t have been guaranteed the tying (or go-ahead) touchdown with a fresh set of downs, but after running step-for-step with the Ducks from the opening gun, the Cougars deserved the chance to have something other than a blown call decide their fate. For comparison, Bama averaged 63.5 plays per game in 2013, and hadn’t run more than 80 plays in a game since 2008. Kiffin shared play-calling duties for the ’05 Trojans with Steve Sarkisian; USC led the nation that season in total offense (579.8 yards per game) and finished second in scoring (49.1 points per game). In Hargreaves’s defense, he bears no responsibility for the busted coverage on Cooper’s 79-yard TD catch in the first quarter or for Cooper’s third TD catch in the fourth. More to come on Watson and Maguire in this week’s edition of QB Curve. The Tigers’ only touchdown to that point had come courtesy of a defensive fumble return. 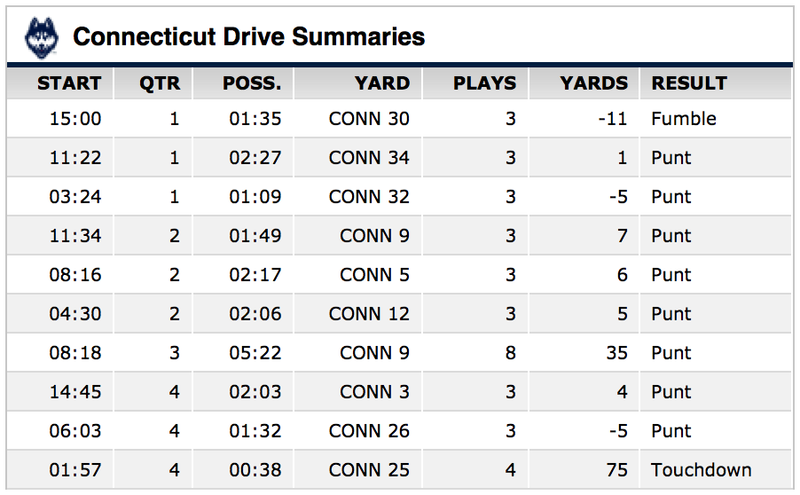 UConn’s first touchdown came courtesy of the defense.